﻿ Ultimate Keylogger - Record applications, keystrokes, passwords, clipboard, chat, email, and visited websites. Ultimate Keylogger is a software that monitors all activities on computer systems including applications, keyboard, passwords, clipboard, chat, email, and visited websites. It sends encrypted activity reports invisibly via Email, FTP or network. We offer a free 5 day keylogger trial so you can see just how powerful our key logger is. Order the full version now! Ultimate Keylogger 2.20 has been released with advanced security features and improved user interface! 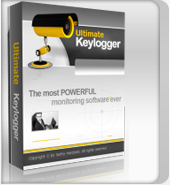 Ultimate Keylogger Free Edition 2.20 has been updated!